NFL insiders cannot believe that Jim Harbaugh would want to take a "step down" to coach college football at the University of Michigan. Their myopic view ignores the passion of college football fans and the personal investment many of us have in our state universities. My dad died in October, and sports are not the same without being able to share the elation of every victory and the pain of every defeat with him. My dad followed all of Detroit's professional sports teams, but he followed only one team with an almost religious devotion. Sundays were God's day, but fall Saturdays belonged to the University of Michigan football team. My dad went to U of M in the late 50s when Michigan football was pretty much as mediocre as it has been the last few years. Everything changed in 1969 when a young coach named Bo Schembechler took over as Michigan football's head coach. Although most fans did not know how to pronounce "Schembechler" when he was first hired, his teams did what no one else did to Woody Hayes's Ohio State teams--took a punch and punched them right back in the mouth. My dad saw the fight in Bo's teams and was hooked. He bought season tickets in the early 1970s and kept them until he died. For about 40 years, he had the same seats in section 8. 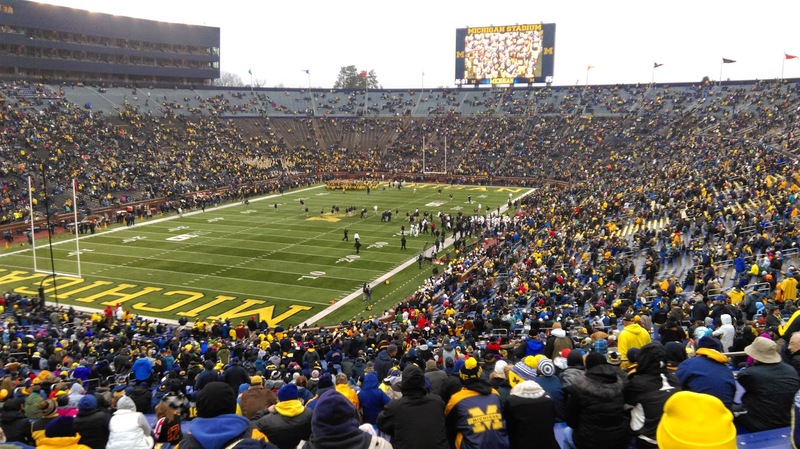 From the first time my parents carried me into the stadium as an infant, I have been lucky to attend many classic games at Michigan Stadium over the last few decades. Except for the years I was a student at Michigan, I watched most of the games from those seats. When the Detroit Tigers moved from their ancient home in Detroit's Corktown neighborhood to Comerica Park, Corktown's future was uncertain. Would the businesses that thrived off the traffic from Tiger Stadium shutter their doors? Would anyone want to move a business into a neighborhood that lost its cash cow? Luckily for Detroiters, businesses did move in. Fifteen years after Tiger Stadium closed its gates, the neighborhood is a foodie destination. 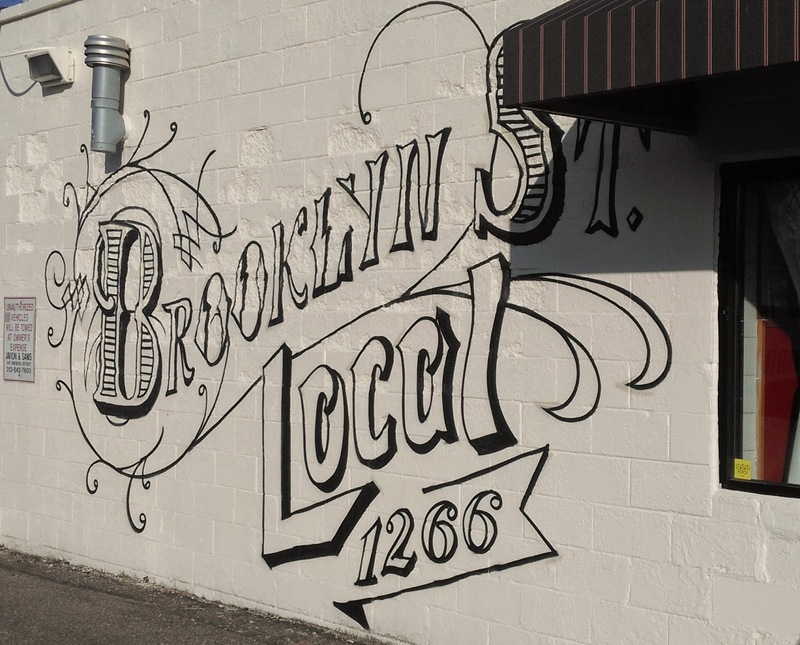 Brooklyn Street Local is one of many restaurants to open up in the last few years. The restaurant uses locally sourced and organic ingredients and carries a wide variety of breakfast dishes and sandwiches, including several vegetarian and vegan options. The Works burger. Definitely not vegan. 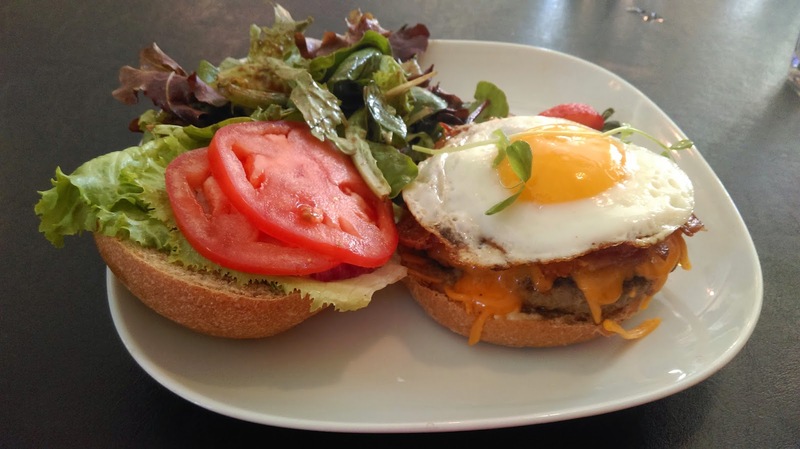 I ordered "The Works," a burger with bacon, cheddar cheese, a fried egg, lettuce, onions, and tomatoes. 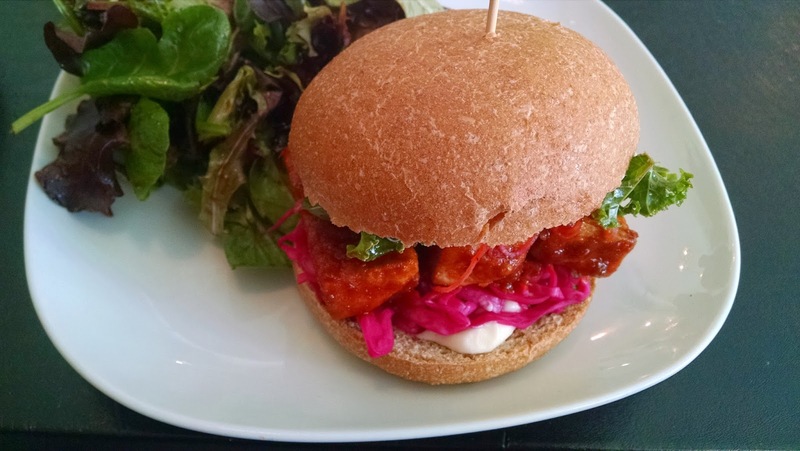 My wife ordered the spicy tofu sandwich (fried tofu, sweet and spicy sauce, kale, and pickled cabbage). We also ordered a spinach and feta omelette for our daughters to share. Our main courses were good, but our poutine appetizer made the meal memorable. Even though the French-Canadian dish has taken over the Metro Detroit restaurant scene, I had not tried poutine until my visit to Brooklyn Street Local. 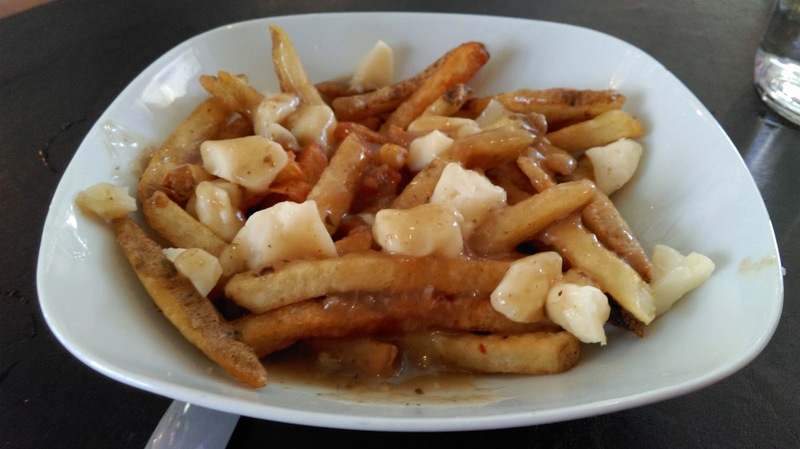 The traditional French-Canadian dish consists of french fries, gravy, and cheese curds. I do not know what the English translation of "poutine" is, but my guess is "sublime artery clogger." Brooklyn Street Local serves a traditional poutine with a choice of mushroom or beef gravy, and they also have vegan and breakfast poutines. Since my wife does not eat meat, we went with the traditional with mushroom gravy. Since I have not had poutine before, I cannot compare Brooklyn Street Local's to other poutines, but I can say it was a great introduction to the world of poutine. With the first bite, I knew that I had found the perfect combination of salty, cheesy, and fried goodness. My eyes have been opened to the world of poutine. Thank you, Brooklyn Street Local. Brooklyn Street Local is located at 1266 Michigan Avenue, Detroit, MI 48226. It is open Tuesday-Friday from 8:00 a.m. to 3:00 p.m. and Saturday and Sunday from 9:00 a.m. to 3:00 p.m. It is closed on Mondays. On the first day of Christmas, my true love gave to me a robin in a cherry tree. On the second day of Christmas, my true love gave to me two McClure's pickles and a robin in a cherry tree. On the third day of Christmas, my true love gave to me three coney dogs, two McClure's pickles, and a robin in a cherry tree. On the fourth day of Christmas, my true love gave to me four Shinola watches, three coney dogs, two McClure's pickles, and a robin in a cherry tree. On the fifth day of Christmas, my true love gave to me FIVE PETOSKEY STONES, four Shinola watches, three coney dogs, two McClure's pickles, and a robin in a cherry tree. On the sixth day of Christmas, my true love gave to me six Michigan craft beers, FIVE PETOSKEY STONES, four Shinola watches, three coney dogs, two McClure's pickles, and a robin in a cherry tree. On the seventh day of Christmas, my true love gave to me seven Herman Miller chairs, six Michigan craft beers, FIVE PETOSKEY STONES, four Shinola watches, three coney dogs, two McClure's pickles, and a robin in a cherry tree. On the eighth day of Christmas, my true love gave to me eight Mackinac Island Fudges, seven Herman Miller chairs, six Michigan craft beers, FIVE PETOSKEY STONES, four Shinola watches, three coney dogs, two McClure's pickles, and a robin in a cherry tree. On the ninth day of Christmas, my true love gave to me nine bags of Better Made chips, eight Mackinac Island Fudges, seven Herman Miller chairs, six Michigan craft beers, FIVE PETOSKEY STONES, four Shinola watches, three coney dogs, two McClure's pickles, and a robin in a cherry tree. On the tenth day of Christmas, my true love gave to me ten cans of Vernors, nine bags of Better Made chips, eight Mackinac Island Fudges, seven Herman Miller chairs, six Michigan craft beers, FIVE PETOSKEY STONES, four Shinola watches, three coney dogs, two McClure's pickles, and a robin in a cherry tree. On the eleventh day of Christmas, my true love gave to me eleven Stormy Kromers, ten cans of Vernors, nine bags of Better Made chips, eight Mackinac Island Fudges, seven Herman Miller chairs, six Michigan craft beers, FIVE PETOSKEY STONES, four Shinola watches, three coney dogs, two McClure's pickles, and a robin in a cherry tree. On the twelfth day of Christmas, my true love gave to me twelve beef pasties, eleven Stormy Kromers, ten cans of Vernors, nine bags of Better Made chips, eight Mackinac Island Fudges, seven Herman Miller chairs, six Michigan craft beers, FIVE PETOSKEY STONES, four Shinola watches, three coney dogs, two McClure's pickles, and a robin in a cherry tree. 'Twas several nights before Christmas, and all through the church, hundreds of creatures were stirring, for they had finished their search. 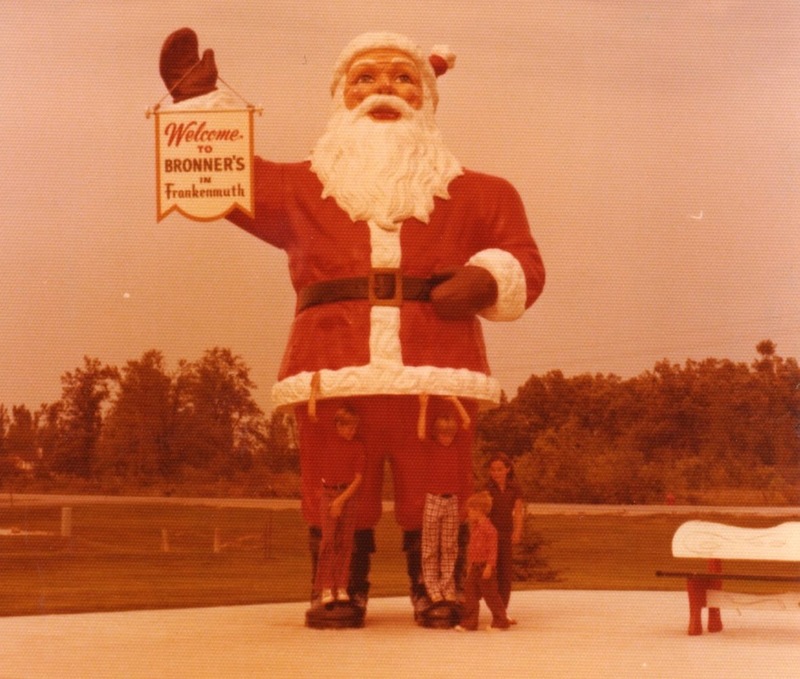 Santa had arrived in old Ann Arbor town, with three giant elves who could really get down. Santa did sing, and the elves did dance, and the children sang too at Santa's entrance. 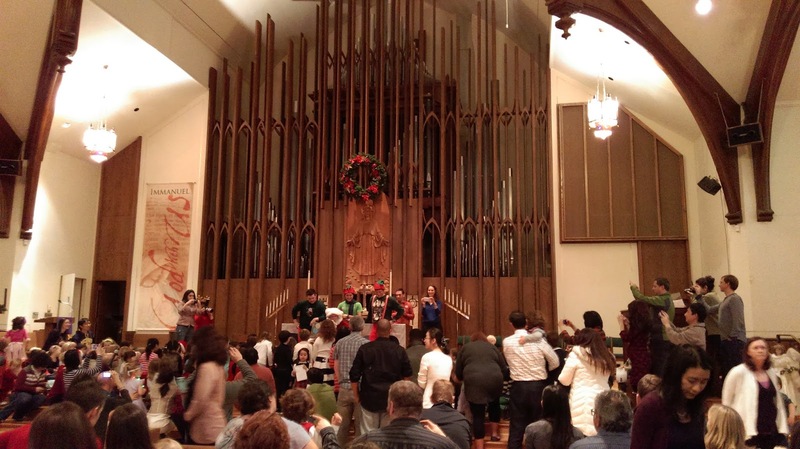 A trumpeter, jazz band, and pianist played, and the children's excitement never did fade. For Santa read them a story much like this one, and they listened in awe to the tale that he spun. They returned to their seats and their parents sang along, until Santa danced off to the very last song. He did not fly away with his elves and reindeer but joyfully waited as each child bent his ear. Santa sat in his chair and listened with care as the children listed the gifts they hoped he would bear. After all of the children gave Santa their lists, there was no doubt in their minds that Santa truly exists. With that last list, Santa flew into the night, and his voice echoed through Ann Arbor, "Merry Christmas to all, and to all a good night!"